later. The most well-known and celebrated South American movement from this era was Tropicália (also known as Tropicalismo), a Brazilian artistic movement that arose in the late 1960s that embraced music, poetry, visual arts and theatre. even further afield, like the USA or Europe. 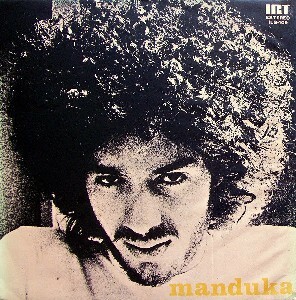 One such musician and writer was Alexandre Manuel Thiago de Mello, otherwise known as Manduka. received an offer from Julio Numhauser to record a record. Numhauser was a key member of the Nueva Canción Chilena movement and founder member of the influential folk music groups Quilapayún. He was also artistic director of the IRT label and the result was an LP composed almost entirely by Manduka, with songs and improvisations that, somewhat inevitably, alluded to exile, Brazilian history and his own encounters with Chilean culture. from popular folk rock group Los Jaivas. The album is a wonderfully fresh and exciting collection of sounds that fizz with energy and hope; one minute a lilting folk ballad, the next an up tempo foot stomping attack on the acoustic guitar. It is the sound of a creative mind at the centre of a flourishing artistic movement just months away from being crushed. to wander the world, living and working in Venezuela, Germany, France, Spain and Mexico, publishing records and books, scoring films, and collaborating with artists such as Naná Vasconcelos and Pablo Milanés. Manduka returned to Brazil in 1988 where he remained until his death on October 17, 2004, due to cardiovascular complications.